New research reveals livelihood strategies in rural Cambodia. Researchers of Bonn University and Cambodia Development Resource Institute (CDRI) conducted a household survey in Stung Treng, a remote province sharing the border with Laos, and released primary findings last month. They aimed to identify rural livelihood strategies for different household clusters, and analyse selected livelihood activities. Their work is valuable because few studies have been examining rural livelihood strategies in terms of food security, poverty and vulnerability. Here is my summary. At the macro level, major source of vulnerability arises from the structure of agricultural production and trade portfolio, skewed to rice farming. Despite an increase in rice production, rice price in Cambodia is less competitive than neighbouring countries such as Vietnam mainly due to transport and milling costs. Most rice producers are small holders with less than one hector or no formal land titles. Fishery and forestry resources decline due to population growth, commercial enterprise, and so on. This makes rural livelihood impaired. Stung Treng is a diverse and poor region. The province is mostly covered by forest, but logging and fishing put high pressure on the forest and fishery reserves. The majority of households live in poverty and 85% of them engaged in small scale farming. Literacy rates are as low as 65%. Few households have access to paved roads, basic water/sanitation (18%) and electricity (14%). The study collected regionally representative data from 600 households in rural areas, which hosted 95,000 people or 17,900 households. Applying cluster analysis and principal component analysis, it identifies five groups with different livelihood strategies. Cluster 3 and 4 are better-off with higher income and consumption linking lower poverty, while the other clusters are poorer. Vulnerability and characteristics are identified for each livelihood strategy. On farming, most households own lands, 2.8 hectors on average, but do not have legal documents for 52% of their plots. That makes farming activities legally insecure. There are 85% of farmers’ households growing rice and consuming 71% of their rice production themselves. 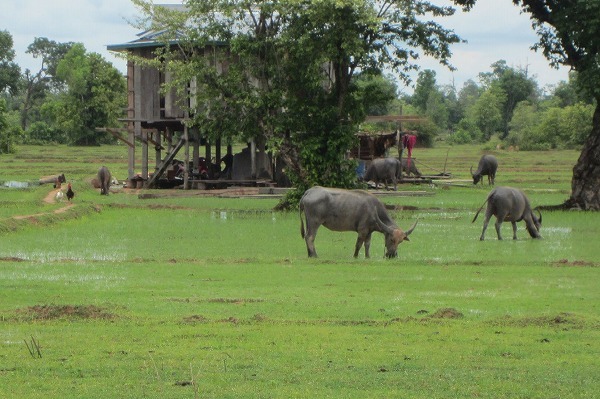 Livestock rearing is another common activity in Stung Treng. Approximately 82% of households own livestock, 52% raise chicken with 14 chickens on average, as minimal investment. Buffalos are raised by 46% of households, and commonly used for ploughing land and owned as asset, followed by pigs raised by 42% for meat, and cattle by 20% for beef. Households tend to own various types of livestock and few of them specialise certain kinds. Natural resource extraction is a popular activity employed by 77% of households, as Stung Treng is endowed with water and forest resources. Migration does not play an evident role in Stung Treng, engaged by 6% of individuals, while being more common among young generation. That is partially because the province is far from Phnom Penh. Moreover, the interviewed households recognise some challenges. Impacts of climate change are raised as a challenge by 99% of households, which affects rain falls, high temperature and strong wind. Human activities also potentially generate a challenge by decreasing trees and wild animals. The households have realised such changes for the past 20 years and expect them remained in the future. The paper notes that the above analysis would be a starting point for further analysis. Although most people in Stung Treng heavily depend on natural resources thorough farming, fishery, logging and other livelihood strategies, the natural reserves are expected to become more and more limited and vulnerable. Buhler et al (2015) Rural Livelihood Strategies in Cambodia: Evidence from a household survey in Stung Treng.